Who'd have thought that SC Paderborn would be top of the Bundesliga table with four games played? Cologne - As appears the case every week, the Bundesliga certainly didn't disappoint in the latest round of fixtures. 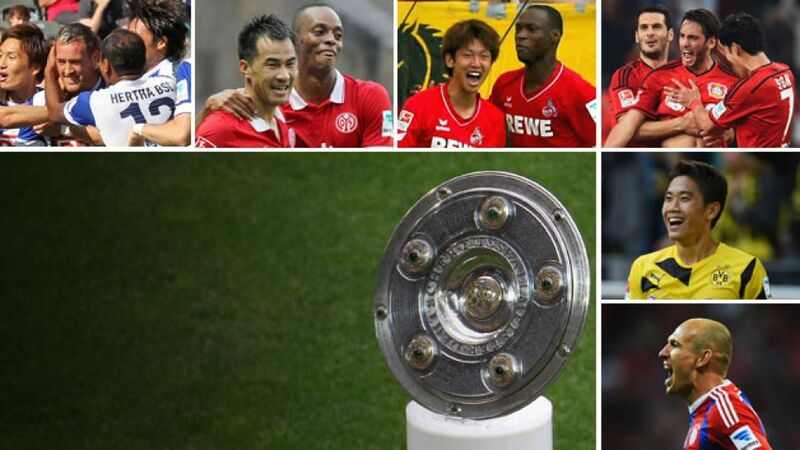 Mainz, Wolfsburg and Hoffenheim all grabbed eye-catching wins, while Bayern were held at Hamburg. The Reds host top-of-the-table Paderborn next Tuesday - what a game we have in store to kick off next week's double-header. Don't miss it! with Eintracht Frankfurt. As a result the winger will miss out against SV Werder Bremen and in the Matchday 6 Revierderby. Things continue to go from bad to worse for the Royal Blues. Never one to miss an opportunity to revel in the heritage their home state, FC Bayern München will have to get the better of league leaders SC Paderborn 07 if they want to maintain their tradition of frequenting Munich's annual beer festival, the Oktoberfest. All aboard: Before the season started the thought of travelling to Munich to take on the reigning titleholders would have been a daunting prospect for SC Paderborn 07. However, on the back of an unbeaten start to the campaign, it seems the newly-promoted side are in fine spirits and rightly so considering they're currently sitting in the position FC Bayern München will hope to finish the season in again. There was no doubt the brand of football they played in the Bundesliga 2 last season was easy on the eyes, but for newly-promoted SC Paderborn 07, the relentless manner of their never-say-die attitude has them soaring to unprecedented heights under the tutelage of one of Germany's most promising young head coaches, Andre Breitenreiter. FC Bayern be warned! This is quite simply breathtaking footage of FC Bayern München on the training ground. Much is made of their star-studded line-up and Pep Guardiola's training methods, but when you see them in action like this you can't help but admire the level of technical ability and precision. Enjoy! draw with Eintracht Frankfurt, but the Royal Blues have received a boost with news that Japanese international Atsuto Uchida could potentially feature in their upcoming clash with SV Werder Bremen. on Saturday, 1. FSV Mainz 05 will be hoping the saying bares no truth. However, they'll have to wait until Matchday 6 to find out, up first for Kasper Hjulmand's charges a trip to Eintracht Frankfurt's Commerzbank Arena on Tuesday. against Hannover that currently has them sitting on top of the Bundesliga pile. On the other side of the fence, FC Bayern München defender Dante also started the new week with words of encouragement. The record titleholders kept a clean sheet, but it was still a disappointing Saturday afternoon for the Brazilian and his team-mates. with reigning Bundesliga champions FC Bayern München, it's not surprising to see that Lewis Holtby and Hamburger SV are in better spirits as they kick off the new week. So much so that the Tottenham Hotspur FC loanee posted a throwback freerunning YouTube clip that will likely provide a source of added motivation on the hardest day of the week: Monday! Welcome back to all the Bundesliga's around the world. We've had two days of rip-roaring action and now it's time for Act 3 in this weekend's play. On the agenda today are two more cracking match-ups - Wolfsburg vs. Leverkusen and Köln vs. Mönchengladbach - as well as all the reaction from Saturday's events. To get you in the mood, here's a picture of Köln's Anthony Ujah with Hennes, the club mascot, ahead of tonight's much-anticipated derby with the Foals. That's all for today then, but remember to join us tomorrow for two more cracking top-flight encounters, VfL Wolfsburg vs. Bayer 04 Leverkusen and the Rhine Derby between 1. FC Köln and Borussia Mönchengladbach. There will be fireworks, that's for sure. Bis morgen! Werder Bremen have enjoyed a good season so far, but the northerners are still without a win. Can they get their first of the season at FC Augsburg this afternoon? Bis morgen! So, that's Matchday 4's off to a cracking start. Four goals and plenty of drama at the Stadion an der Schwarzwalderstraße, but there's loads more to come this weekend, including FC Bayern München’s trip to Hamburger SV, the battle of the two Shinjis, and much, much more. Join us on Saturday as we look ahead to all the action. See you all then! First up on Bundesliga radio this weekend is SC Freiburg’s match with Hertha. Which of the two teams will halt their winless run? Tune in at 20:30 CET to find out! has struggled to recreate the form that saw him fire in 12 goals in 2013/14. Now injured, the Black Forest outfit's goalscoring issues are unlikely to be appeased. As this SC Freiburg fan (below) points out, it now comes down to whether Streich's second string can step up to fill the void left by the Swiss international striker. Friday night will be their first test. Do you think they're capable? from injury. The Japanese midfielder could slot back into the starting line-up on the left flank this weekend.